My hair has gone through many phases over the years. My natural dark brown/black hair has been highlighted, digital permed, and more. The boldest hair color I’ve ever done was bright red streaks during high school. But, I’ve always wanted bright pink hair. Alas… gone are the days when crazy hair was a realistic possibility, now that I’m technically an adult with big girl responsibilities. Thanks to Redken and their new Color Rebel Hair Makeup, I can live vicariously (at least through two shampoos) and rock fuschia hair! Using makeup technology with direct color pigments, Color Rebel deposits a very fine colored micro-coating on the surface of the hair, making it resistant against water and mechanical aggressors, such as brushing, blowdrying or flatironing. Color Rebel’s pearlescent pigments create multi-dimensional, iridescent color effects. The water-based ink allows for easy flow through the sponge applicator and dries quickly, creating less of a mess during application. 1. Prime the product by shaking well and twisting the cap in the direction of the arrows until the tip is saturated. 2. 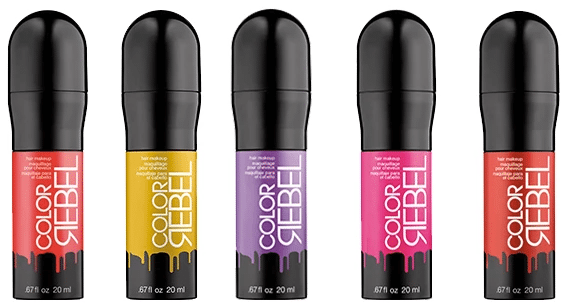 Apply Color Rebel to clean or day-after hair by gently pulling sections taut and applying in a smooth sweeping motion. Start with a light layer – you can always add more to build color intensity. 3. Simply let hair air dry or blowdry for faster results. Keep combing or brushing to a minimum after applying as this will break up the color pigments. For a more subtle effect, dispense just a drop of product on the sponge tip applicator and use longer sweeping motions to apply the color in one thin layer to a smaller section of hair. Gently comb or brush each section to break up the color pigments. The wonderful thing about Color Rebel is that it’s so versatile- whether you just want a subtle streak or your entire hair colored. It did make a mess on my hands during the application process, so I would recommend wearing gloves. But since applying and setting the color with my blow dryer, none of it has transferred to my clothes! I’d be curious to see the results on someone with healthier hair—my ends are fried from bleaching, so adding the color makes it feel kind of crispy. Despite that, the overall effect is so fun—I’ll definitely be experimenting with this more in the future. Can’t wait to try the other shades as well! Which Color Rebel shade are you most excited to try? I received complimentary Redken Color Redken products via Brandbacker to review, but all opinions are my own. HOLY cow this color is gorgeous. I will be curious to hear how it washes out for you because I am totally eyeing that purple. It did not wash out very well today– they did say you could use oil to make it come out easier, but let’s just say that my hair was in a bun this morning for my work presentation. 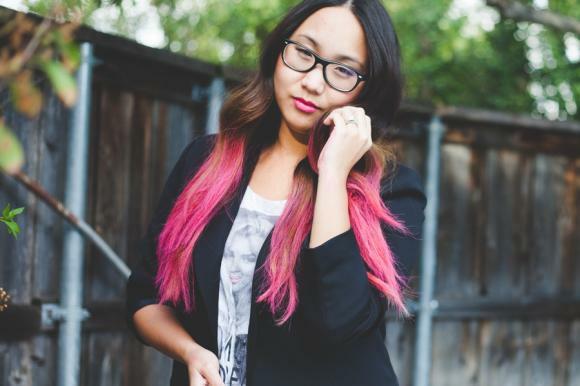 I’ve gotta try this– colorful hair seems like so much fun, but I, too, worry about the impact on my big-girl-adult life. Thanks for such a great informative review. Would love to see the results if you try it, Harper!! I’m dying to get the purple and coral shades next. I am obsessed with this and totally would like to give it a shot. That gold shimmer sounds like its going to be right up my alley! I foresee a hair party in our future! I got a sample of the gold shimmer!! I’ll bring it on Thursday for you– it won’t show up in my ombre.